Welcome to Microsoft Cloud + AI International Community Leaderboard! 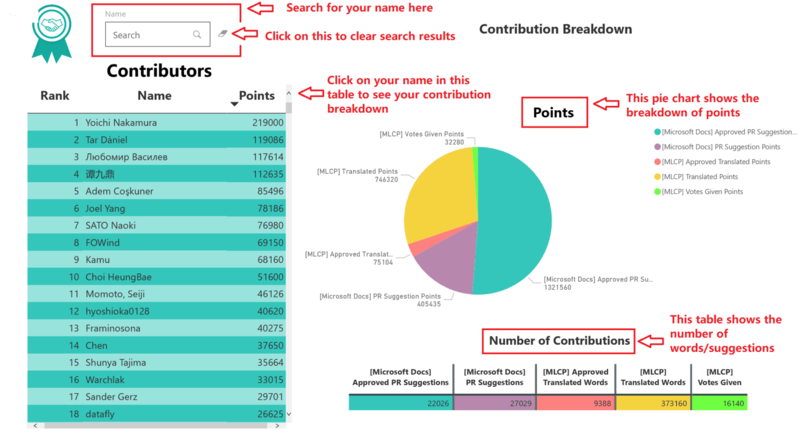 This leaderboard shows a full list of our contributors with points earned from the contributions to Microsoft Localization Community Platform and Microsoft Documentation. You can access the MVP Specific Leaderboard here. NOTE: Suggestions are reviewed and approved/rejected by linguistic moderators. Example: a contributor submits a pull request with 4 suggestions. They receive 4 x 15 = 60 points. If the suggestions are approved, then the contributor receives an additional 4 x 60 = 240 points. - Each Translated Word is worth 2 points. Example 1: A contributor translates a string with 9 words. They will receive 9 x 2 = 18 points This string is approved when it receives 2 or more votes from the community. The contributor receives an additional 9 x 8 = 72 points. Example 2: A contributor votes for 5 translated strings, that have all been translated by another contributor. The contributor who has voted gets 5 x 2 = 10 points. NOTE: we only show the contributors who earn 100 points or more in the leaderboard. You can find more details at the Microsoft MVP site. - you find your name/account occuring multiple times in the leaderboard, and you want them merged. - you want your name/account removed from the leaderboard. For feedback about the leaderboard, please submit your requests here.